Five days after my most recent post, I was informed by Anna’s caregivers that my services were no longer desired. Their formal and impersonal email came as a complete surprise to me in the absence of any prior discussion or hints there was something amiss. I suspect that the two friends responsible for her care never really understood what ElderSparks was about or how much each session meant to Anna. They simply expected that the four-five hours/week I spent with her would accomplish what counseling sessions, anti-depressants, outside excursions, and nursing home recreational activities hadn’t, and that anything short of a miraculous transformation wasn’t worth the expense. I waited until the end of our last appointment to tell Anna I wouldn’t be returning. Our final project was an improvisational effort that produced a mini (micro might actually be more accurate) graphic novel. 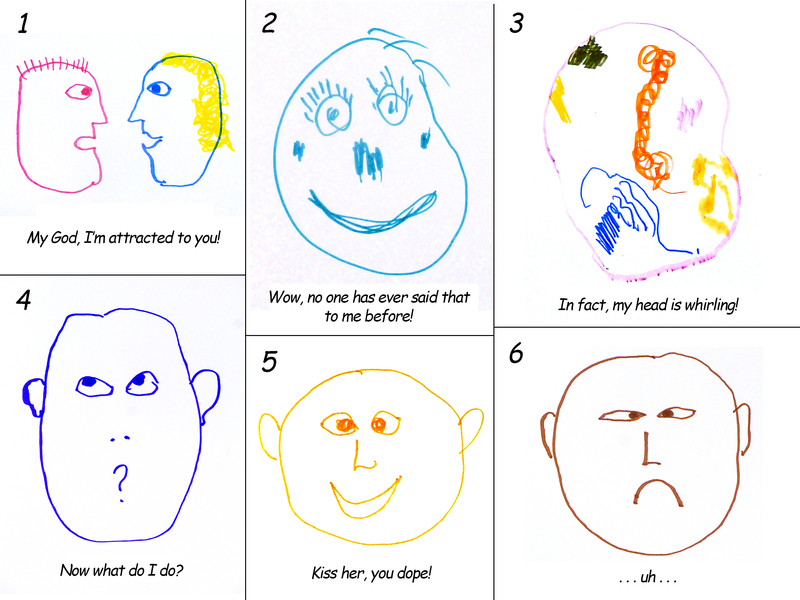 We began by drawing faces that depicted various emotional and mental states, e.g., anger, joy, bewilderment, worry, fear, sadness, etc. From these, we took turns selecting pictures and making up dialog that would match the expressions. (See https://eldersparks.wordpress.com/2012/11/27/fall-highlights-part-5-off-broadway/ for the original inspiration.) Anna immediately set the wheels in motion for a drama filled with unrequited love. In the end, our romantic leads go off to an unknown fate in the mountains. It was a narrative that evoked lots of laughter, but not for long. Our relationship was coming to an end and the news left Anna shaken and distraught to a degree I had never anticipated. If you leave, I leave. This [the ElderSparks work] hasn’t made me feel better about being here, but it has made it livable. I don’t feel out of place with you; you make all the difference to me; the two days make a big difference. It was as if the ground beneath her being had suddenly dropped away leaving her lost, alone, and adrift. I’ve had many highs over the years in my work with elders and remarkably few disappointments. Nothing has brought me as low though as witnessing the despair Anna felt when we said goodbye. She’ll recover soon enough, I’m sure, but at the time, it felt like a needlessly cruel and uncaring decision. Oh, I’m so sorry to hear about Anna’s reaction to your news, Alan. I hope you both recover “soon enough”.